NASHVILLE, Tenn. - August 22, 2014 - Following a successful 37-city spring run which played to more than 154,000 fans, multiplatinum-selling GRAMMY® winners Casting Crowns will extend its THRIVE Tour this fall with an additional 39 U.S. tour dates in support of the band's critically-acclaimed studio album, THRIVE (January 28, 2014). 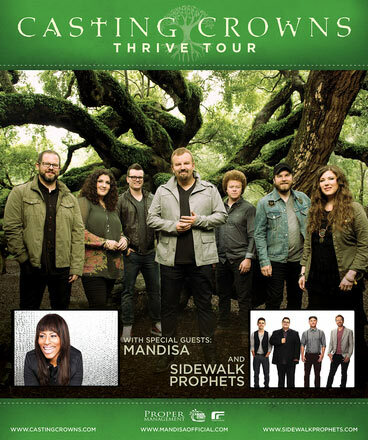 The THRIVE Tour will feature GRAMMY® nominee Mandisa and Dove Award winners Sidewalk Prophets. The fall leg of the tour kicks off Sept. 18, in Las Cruces, N.M., and will continue throughout the fall visiting major markets including Los Angeles, Phoenix, Spokane, Oklahoma City, Nashville, San Antonio, Tulsa, Birmingham, Washington D.C. and Pittsburgh, among others. In the past year, Casting Crowns has garnered numerous accolades including three GRAMMY® nominations, an RIAA 2x multi-Platinum certification and multiple RIAA Gold certifications, with total album sales surpassing 8 million. Building on that momentum, The THRIVE Tour is sure to not disappoint, with a set list that includes Casting Crowns' biggest hits - spanning more than a decade of ministry - in addition to selections from the group's new release, THRIVE (Beach Street/Reunion Records), the band's first full-length effort in two years. The songs on THRIVE are an extension of what lead singer/songwriter Mark Hall has been teaching his students at Eagle's Landing First Baptist Church in Atlanta, where he serves as youth pastor. The heart behind the project is for these songs to encourage believers to dig down into the roots of who they are in Christ so that they are fully equipped to reach out and share their faith with others. Following this theme, half of the songs on the album are focused on "reaching out," while the other half are dedicated to "digging deep." Prolific CCM band Casting Crowns has achieved major sales milestones including one RIAA 2x multi-Platinum album, three RIAA Platinum albums, two RIAA Platinum DVDs, six RIAA Gold albums, four Gold DVDs and four RIAA Gold certified digital singles. The band currently holds the position as Billboard's top-selling act in Christian music since 2007. The group has also been honored with two American Music Awards (out of six total nominations), a GRAMMY® Award for its 2005 album Lifesong, has received six GRAMMY® nominations, garnered 17 GMA Dove Awards and two 2012 Billboard Music Awards (out of six total Billboard Music Award nominations). Casting Crowns' seven band members all remain active in student ministry in the Atlanta area and tour according to their local church commitments. Serving his 20th year in youth ministry, lead singer/songwriter Mark Hall maintains his role as the student pastor at Eagle's Landing First Baptist Church in Atlanta. On January 28, 2014, Casting Crowns released its seventh studio record, THRIVE, which follows the release of its 2013 collection album, Acoustic Sessions: Volume 1. For more info, visit www.CastingCrowns.com. With more than 1 million records sold, GRAMMY® winner and American Idol Season 5 finalist Mandisa is a voice of encouragement and truth to people facing life's challenges all around the world. In less than a year, Mandisa performed her three hit singles "Overcomer," "Good Morning," and "Stronger" on the highest rated morning show, ABC's Good Morning America (GMA.) Her performance of "Stronger" welcomed the emotional return of beloved morning host Robin Roberts. The NFL also welcomed Mandisa to perform the national anthem during a Sunday night NFL Network game to kick off Breast Cancer Awareness month where she was joined by members of the 49ers family who are survivors. Her album, Overcomer, released August 27, 2013 and debuted at No. 1 on the Billboard Christian Albums Chart, with the album's title track holding on to the No. 1 spot for twelve weeks on the National Christian Audience chart as well as the No. 1 position on the Christian/Gospel Core Digital sales chart for several weeks. This year, Mandisa was awarded a GRAMMY® for Best Contemporary Christian Music Album for her best-selling and critically acclaimed project Overcomer, while "Overcomer's" songwriters (David Garcia, Ben Glover & Christopher Stevens) won the GRAMMY® for Best Contemporary Christian Music Song. Additionally, she received five nominations for the 45th Annual GMA Dove Awards, including a nod for "Artist of the Year." For more info, visit www.mandisaofficial.com. Sidewalk Prophets have made an impressive debut on the music scene, from winning the Dove Award for "New Artist of the Year" in 2010 to selling more than 350,000 albums worldwide. With non-stop touring and No. 1 radio singles like "You Love Me Anyway" and "The Words I Would Say," the group has quickly become one of the top-selling new CCM artists of the past five years. For more info, visit www.sidewalkprophets.com.